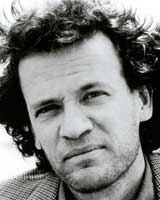 Yann Martel is famous for his incredibly popular, Man Booker Prize-winning novel Life of Pi. He's just published Beatrice and Virgil, a thin tome that packs a big wallop. Similar to Pi with an animal allegory, we also get a semi-autobiographical look at Yann's post-Pi life. Another layer to the story is a writer and his play, which ultimately is about the Holocaust. Reviews have been very mixed, but with many strong opinions. Martel was born in Spain. He studied philosophy at Trent University, worked at odd jobs—tree planter, dishwasher, security guard—and travelled widely before turning to writing. Martel lives in Saskatoon with the writer Alice Kuipers and their son. At a meeting with his publisher, Henry's asked "What's your book about?" The publisher doesn't want to sell a book they can't describe in a pat sentence. This challenge is true for Beatrice and Virgil. How would you describe it? Writer meets taxidermist meets Holocaust. Or: story meets horror. This book is getting attention for its reviews—some were highly critical, while others were highly positive. Reviews on LibraryThing run the gamut as well. Did you think there would be a complex response to this book? What have you taken away from the varied reviewer responses? I had no particular expectations. Art is a gift: you create and then you give away. How readers receive that gift is their business. If they hate it, that's their response to it. Others respond by liking it. Either way, that is their interaction with the book, which is no longer mine. And better to have a book met with praise or scorn than indifference. If the reviewer for the New York Times, for example, hated it, clearly my book approached the Holocaust in a way she was not comfortable with. She has an orthodox view of how the Holocaust should be represented, one that shies away from using the tools of the literary arts, allegory in this case. Is that my problem—or hers? For any of your works, what makes a positive or negative review useful to you as an author? I think there are four kinds of reviews: bad bad reviews (readers who hated your book for the wrong reasons), good bad reviews (readers who hated your book for good reasons), bad good reviews (readers who liked your book for the wrong reasons), and good good reviews (readers who liked your book for good reasons). In every case, it's the reader's interaction with your book, but the good bad reviews and the good good reviews can be useful, because these readers have read your book with the intentions closest to the reader's own heart; that is, they read the book like the writer did himself/herself while writing it, pointing out its legitimate weaknesses and strengths. From bostonbibliophile: I was wondering why Mr. Martel wrote Beatrice and Virgil as a book about writing a book, or about writing an allegory and didn't just write the allegory instead, without Henry and Henry. I did "just write the allegory". It was a novel in the form of a play. It didn't work. There's no artful plot to genocidal mass murder. It's a tragedy in which the personality of victims and victimizers is irrelevant (they're just there to be killed or to kill), in which the activities of the victims before their death is irrelevant (no matter what they might be doing, their fate is predetermined), in which the narrative arc is fixed (in a genocide, by definition, a significant portion of people must die). In other words, a genocide is a story that goes like this: they lived, and then they were all murdered. The taxidermist says it as one point: "My story has no story. It rests on the fact of murder." That's a story-killing story. So I took my allegory, the play featuring Beatrice and Virgil, fragmented it and imbedded it into another layer that—you're quite right—is a story about writing a story, a story about a search for artful words. That was my creative reaction to the Holocaust. On your website, you say that you drew a parallel between the writer Henry's famousness as an author to Jews being a famous group of people. How does that parallel work? What is brought out by Henry being famous? What is brought out? He stands out because he's famous, just as Jews have stood out because of their "fame". Henry might appear to be an autobiographical character, read it that way if you want, but to me he's a stand-in for Europe's Jews, like Beatrice and Virgil. So Henry plays the clarinet and is an amateur actor (i.e., he's involved in the arts), is multilingual, is "famous" and meets his fate at the hands of the taxidermist without ever fully understanding him or seeing what was coming, just as Europes's Jews were highly involved in the arts, were multilingual, were a well-known minority, and, lastly, tragically, met the Nazis without ever understanding their malefic intent before it was too late for most of them. Beatrice and Virgil seems to give us a lot of information about Life of Pi, and about your life after it was published and became incredibly popular. How autobiographical is Henry's life to yours? Why did you put yourself in the story? I answered the first question already. As for the second, I put myself in the story, or, rather, I put a writer in the story, because I wanted the observer and the observed, the storyteller and the story, to be in dialogue. History is a dialogue. We participate in its reading and what we make of that reading. I didn't want a story with the writer on the outside coolly, invisibly, "objectively" writing his story. I wanted the subjectivity, the involvement of it to be more apparent, because that's how history works. We are in a ceaseless dialogue with the past, the present and the future. From bcquinnsmom: I just have to ask re Life of Pi (which I loved by the way): what was the significance of the island? I read the book a while back & still never figured it out! The island was meant to float just beyond what you could reasonably believe so that if you chose to believe the first story, the story with animals, you had to make a leap of faith, to abandon your excessive rationality, to say to yourself "What do I know about oceans and algae and meerkats?" --and be the better for making that leap of faith. It's very refreshing not being a rationalistic robot. We have gods to figure out what life is all about. We might as well just live it, using reason as a tool, but at the service of some faith, whether religious, political, romantic, artistic, etc. From herzog: In his book Performatism, or, the End of Postmodernism, Raoul Eshelman discusses Life of Pi as "something of a logical challenge to postmodernism". Did you consciously set out to write a challenge to postmodernism or do you even feel it is a fair description of the novel? I set out to write a challenge to rationality and its excessive use. I don't mind the fractured perspective of postmodernism, I do mind its neutering cleverness, and mostly I don't care about literary labels. From mathgirl40: I recently finished What is Stephen Harper Reading? [about Yann choosing books to send to the Prime Minister of Canada] and enjoyed it immensely. You make a very persuasive argument for reading widely. What are your future plans for the blog? Will you continue the blog or perhaps create a new one if we end up with a new prime minister in the next couple of years? I will continue sending books to Prime Minister Harper for as long as he's in power. The book has only the first 55 letters and books I sent the Mr. Harper. There's an ongoing public witness of my guerrilla book club at www.whatisstephenharperreading.com. We're at Book Number 80. After Mr. Harper leaves office, I'll leave it to other writers and readers to engage with the political class. From gordsellar: Hailing from Saskatoon, I'm curious how you find the city in terms of its effects on your writing, if any. It never inspired much in my own writing until after I left, but of course, it's where I come from and that's an all-too- common phenomenon; however, I wonder how a writer coming to Saskatoon reacts to the place, and whether you see any more inspiration in it because you come there as an outsider. Saskatoon is a good community set in a beautiful landscape. It has the highest quality of life of any city I've lived in. So it helps my writing by making me happy. ShelfMonkey would like to know if there will be as long a wait for your next book as there was between Life of Pi and Beatrice and Virgil. I hope not. The next novel—which will be called The High Mountains of Portugal—is already clear in my mind, the way Life of Pi was, and I hope to get started on the research some time this fall. But I do have a nine-month-old son. He might keep be busy in other ways. From ironjaw: Are you a book collector? Do you collect any particular genre or books in general? No, I'm not a bibliophile. I love stories, but books are objects to me, inspired objects, of course, but still a burden to move around. I think books are like fish: they do best when they're moving. So I'm happy to read and then give/sell a book. Have read any books lately that have knocked your socks off? Chinua Achebe's Things Fall Apart, which I had never read before. A simple, subtle, evenhanded and powerful tale of Africa's encounter with British colonizers. My bookshelf is a sloppy place, full of books I've read and haven't, of books that I've loved and can't quite get rid of, books I will read, and then others that I haven't read but think I should. I don't like stuff. I hate the clutter of our materialistic Western cultures. My ideal bookshelf would be the single book that's in my hand, with a great library nearby.